From R2-D2 to Transformers to Wall-E, kids are obsessed with robots. So what could be more enticing than turning a tape dispenser and on old eater bottle into a functioning robot? The irresistible Recycled Robots book and kit shows kids how to use their imaginations and old toys to design and build their very own robots! 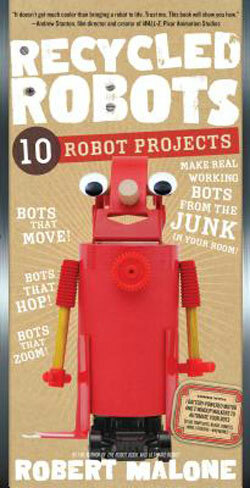 Recycled Robots by Robert Malone retails for $24.95, but is currently on sale for $16.47 with FREE SHIPPING. Recycled Robots is the brainchild of famed designer and chairman of the Automation Hall of Fame, Robert Malone, whose love for green design inspired the kit. His philosophy is that "young people should learn to use their minds, their eyes and their hands to make fun and useful things." Armorbot ~ Use the enclosed template to turn a tired action figure into a battle-ready armored machine! Styrobot - Old packing foam boxes become a life-sized robotic buddy. Weebot - An empty PLAY-DOH container, some foil and a few spare LEGO parts come together to make an itty-bitty stealth spybot! The 144-page book goes into the history of robotics and looks at the real-life robots of today. It also includes a whole chapter on designing your own robots, with plenty of sketch paper to work out the details. Recycled Robots gets to the essence of creativity and imaginative problem-solving, turning kids into the inventor, designer and engineer of their own robot creations. Disclosure: I received Recycled Robots by Robert Malone from Workman Publishing in order to facilitate this feature. No other compensation was received.